« What’s Behind NH’s Recent Net Out-Migration? The Skills Gap Part Deux: Some Evidence and Who’s Fault is it Anyway? A good national job growth report was released today that showed private sector job growth was up 184,000 in October. With government job losses at -13,000, total employment increased nationally by 171,000. We have to wait a few weeks to see NH’s job growth for the month but regardless of the number, the underlying causes of the state’s relatively slow recent job growth still need to be debated . A solid and empirically-based understanding of the factors influencing job growth rates is the only way to formulate effective economic policy in the state. I am on record as saying (probably too often) that I believe NH’s job growth numbers will be revised upward at some point (probably with the annual revisions released early next year). But even if that is true (errr, when it is conformed to be true), by historical standards, recent job growth in NH will still have underperformed. Whether job growth is slower now than in the past because employers are not willing to add additional workers or because they are not able to find qualified workers (the “skills gap” argument) is among the most important issues to understand in setting both national and state-level economic policies. If employers are unwilling to add employees that are readily available, then the efforts to spur job growth focus more on factors affecting businesses (tax rates, regulations, costs etc.). If job growth is constrained because employers are unable to find qualified workers to fill open positions, then the focus of efforts to spur job growth will be more effective if they look to increase the skills of the labor force, and/or better match them to the needs of employers. In reality this is not an either or question because inadequate attention to the needs of either employers or the workforce will produce sub-optimal economic growth. But in today’s polarized policy environment whatever light is shed on these issues is too often separated by an ideological prism that produces policy proposals aimed at either the needs of business or the needs of the workforce to the exclusion of the other. If job growth is slowed because there are too few qualified workers to meet the needs of businesses then it is not policy maker’s fault but they can help alleviate the problem by adopting more “human capital” policies. Businesses bear some of responsibility for any skills gap because studies have shown that businesses spend less time and money training workers than they did decades ago, and that more of the training that does occur is concentrated on management positions rather than mid- and lower- level positions. In an age when job turnover has accelerated, and the tenure of workers with one businesses continues to decline, it is understandable that businesses would be less willing to invest in workers who may only be with their firm for a short while. But who is more responsible for the decline in employer-employer loyalty and tenure? The labor market has been signaling strong demand increases in many occupations – especially technical and scientific occupations and increasingly skilled production occupations. Older and experienced workers may have difficulty responding to these demands if their experience, education or training is in occupations in less demand but why are younger and new entrants to the labor market not responding to these labor market signals by selecting the majors or training programs that would qualify them for more occupations in demand? One reason is that regardless of whether or not the labor market is signaling many job opportunities in technical and scientific occupations (or skilled production occupations), if large numbers of the emerging workforce don’t have the intellectual and academic rigor to study these subjects the positions will increasingly go unfilled, go elsewhere, or as I will document in a later post, be filled by foreign born workers. Ok, that was a bit of a rant, now back to the core issue. Is there evidence of a skills gap in NH that is constraining job growth? The answer of course, as it is with almost all economic issues, is both yes and no and also something in-between and with a twist. I will share this evidence across several postings, today I offer one, small bit of evidence that suggests the skills gap is playing a larger role in disappointing job growth trends. I noted in an earlier post that help-wanted advertising has generally been on the rise in NH, while job growth has not. Some of this will be corrected with job growth revisions, but evidence that a skills gap is playing a role comes in the form of the percentage of help-wanted ads each month that are “new ads”. 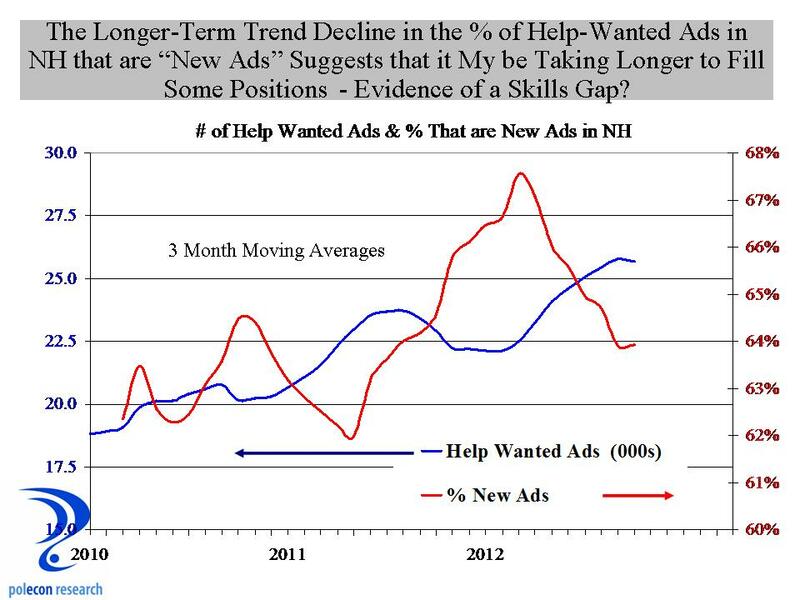 If help-wanted ads are rising and the number or percentage of new ads is rising similarly each month, that means positions are being filled at a fairly consistent rate, but if the number of ads is increasing, but the percentage of ads that are “new ads” is declining, that suggest that positions are not being filled or taking longer to fill – perhaps suggesting employers are having a harder time filling the positions or a skills gap. The chart below shows that indeed, the percentage of monthly help-wanted ads in NH that are :new ads” for the month has been slowly declining, providing some small bit of support for the skills gap explanation for job growth. A lot more evidence is needed, but given the importance of the issue in policy making, it is worth the effort to find or refute it. This entry was posted on November 2, 2012 at 11:37 am and is filed under Educational Attainment, Help Wanted, job growth, NH Economy, Skills Gap. You can subscribe via RSS 2.0 feed to this post's comments.